Digital cameras, cell phones, laptops, smartphones, and music (mp3) players are all rechargeable devices. The fact that these devices will be heavily used throughout any trip to another part of the world means they will need to be recharged. Limited battery use can be very stressful so make certain to find the right chargers and/or travel plug adapters. 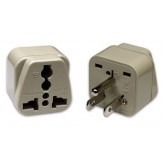 When traveling abroad you can use the travel plug adapters for many devices in different parts of the world. 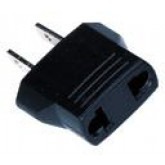 The European travel plug adapter with 110 to 220 volts can be used in almost any country throughout the world as it supports ranges from 100 to 240 volts. When traveling to Japan you will find 100 volts necessary with 110 volts the norm in the United States. 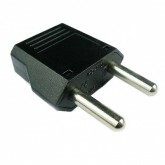 In Europe, you will need a 220 volt adapter. 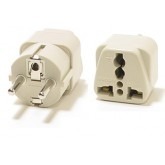 When choosing a specific travel plug adapter for your needs make sure to check our Plug Adapter Kits by Country. We have created an easy way to navigate each and every country. At the top of the browser you will see letters in alphabetical order. You can hover over any of the letters to click on the country in which you will be traveling. 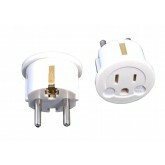 We offer travel plug adapter kits for all countries. IEC-320 C13 outlet female Adapter This WonPro power plug adapter lets you connect a wide variety of plugs into a standard Universal receptacle. We love our electronics, whatever we may use them for. And cameras, phones, tablets, notebooks, laptops, and mobile devices are all rechargeable appliances which, during your travel from one place to another, are often a favorite travel buddy. But every rechargeable device has limited battery timing, so it's necessary to keep the all the right chargers and/or adapters with you. However, before bringing them abroad, it is important to check the compatibility of your adapter with your electronic devices. You can find that information on the label of your charger or at the bottom of your rechargeable device. So when you're selecting an adapter from 110220Volts, it should feature 110 to 220 volts, because this type of plug is suitable for almost every kind of electronic device in more than 150 countries, including Europe, United Kingdom, United States, China, Japan, Malaysia, Singapore, Hong Kong and more. Just select your desired country, and our long list of available and suitable travel plug adapters will be shown to help you to pick the most suitable adapter for your needs. They are easy to store, available at low prices, and come with a guarantee of efficient performance. For further convenience, the universal travel plug adapter is available in all shapes and sizes so you can easily plug in your different electronic devices while traveling. 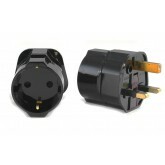 These adapters are designed to tender to the needs of all travelers and also come with surge protection and a warranty. There are more than 30 different plug adapters around the world, and a universal adapter will make it easy for you to plug any charger in it. If you don’t want the universal travel plug adapter, a European travel adapter is also a good all-purpose foreign adapter that you can easily use for multiple devices and in different areas. For instance: most cell phone chargers, iPod chargers and laptop chargers equally support 100-240 volts. The range of plug adapters around the world is 100 in Japan, 110 in America and 100 to 240 volts around most of the rest of the world. That means that a European travel adapter with 110 to 220 volts can be used around almost the entire world, providing it matches the sockets in your chosen country, of course. In order to help furnish customers all around the world with their electronic needs, we've provided an adapter index by country at the top of the page. You can find the suitable charger for every country by hitting the name of your required country. You can also choose from a wide assortment and variety of adapters, such as a grounded adapter plug, a non-grounded plug adapter for notebook, a digital audio player adapter and a cellular phone adapter, as well as all the normal kinds. 110220Volts has just about any and every adapter you’d need. All products are accessible via our easy to navigate website; just place your order to get them quickly. If you have any queries, contact the customer service specialists and ask them any questions you may have about policies, business procedures and conditions. Online shopping with our website is 100% secure, and all plug adapter kits are also available with a carrying pouch so that you can carry it easily while traveling. Shop 110220Volts today!